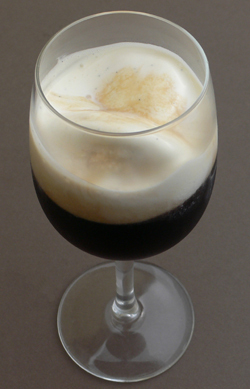 A great Irish ice cream flavour is Irish Cream Liqueur (we use Baileys), and we call it “Bó Bhán” (white cow) in Irish. 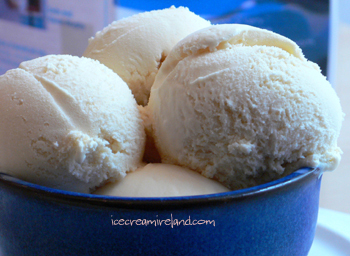 It’s an easy ice cream flavour to make, and the alcohol in the recipe improves the consistency. 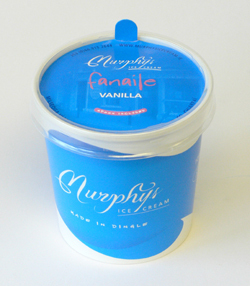 This ice cream partners chocolate cake or fruit tarts perfectly. It is also excellent served in hot coffee at the end of a meal. 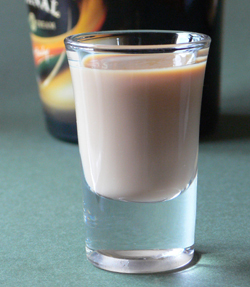 Mix in the cream and the liqueur, beating for one minute. The Discovery channel is filming in Dingle as part of a series of great walks (the Mount Brandon walk is one of them). The only shame was that it was a bit disruptive to our regular customers (who made themselves scarce at the first sign of the camera), and I appreciate their patience! 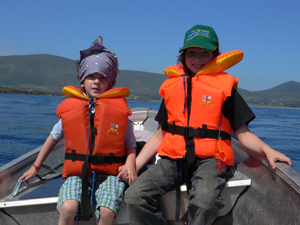 After the tours around town and the peninsula, the ice cream and the dolphin, a lovely couple of hours can be spent in Dingle in a rather unique way, especially if you like mazes or have some kids in need of entertainment. 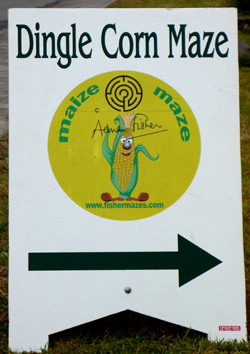 The Dingle Corn Maze, right in town, is definitely worth a trip. 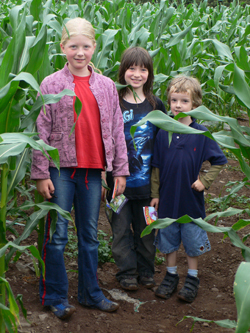 Planted across five acres by the farmer who supplies us with Kerry Cow Milk, the maze has a dinosaur theme this year and was laid out with computers and lasars. Spare a thought for Colm, the farmer, who did all of the plucking of corn for the paths by hand! There are also picnic tables, a rope maze for kids to clamber around, finger mazes, and other bits of entertainment. For me alcohol and ice cream are natural companions. If it wasn’t for the licensing laws in the country, I would love to be able to serve alcohol over ice cream (not to mention with coffees) for the customers in our shops. Alas, that is not to be! However, it is not illegal to do it at home, and it makes a very adult and heady dessert. 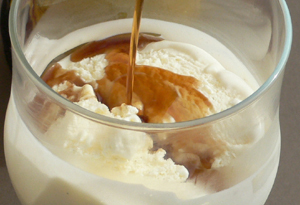 You can either pour in some booze first and then add the ice cream or simply serve a shot over the ice cream as you would a sauce. 8. Chocolate with whiskey (Irish whiskey is great since it’s not over-powering). 9. Pear, peach, strawberry, or black currant sorbet with champagne. 10. Port with just about anything. I was lucky enough to grow up with a grandmother living on the border of Italy and Switzerland, and every time she visited, she brought a huge sack of chocolate. I guess it’s her fault that I turned into such a chocoholic! Her chocolate bars of choice were Frey and Lindt, and at the time they were exotic luxuries. When we first opened the shop here, Lindt was still a rarity in these parts, and when we wanted to buy some, Lindt Switzerland directed us to their English subsidiary, who treated us in a beastly fashion, and we could only infer that theyÂ had no interest in our custom. Last year, however, Lindt put a salesman in Ireland. He was very friendly and pro-active, and we brought in their chocolate. It has sold well for us, and it certainly had nostalgia value having grown up with it. But the salesman has proven to be too good, and now Lindt is in every shop around, so we’re considering dropping it. 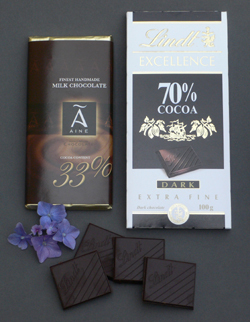 There is more and more variety in Irish chocolate, and Aine’s now have a range of bars, including a diabetic bar. It’s always good to support Irish producers, and we’ve brought in some to see how they sell (we’ve carried her boxes of truffles for some time). In any case, we won’t be lacking for variety when it comes to chocolate bars, for we have a huge range of Valrhona, and my brother and I are completely hooked on the stuff! 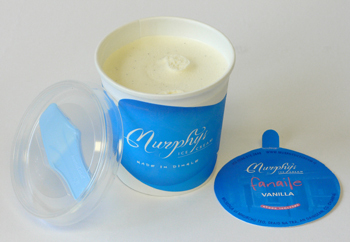 Â A customer in our Dingle shop told me about a coffee drink that she had come across in Italy. I had never heard of it andÂ so I tried it out with good results. 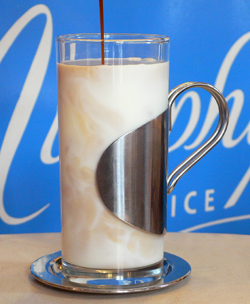 It’s very simple – you take a glass of very cold milk and add a shot of espresso. With all the hot weather we’ve been having here it makes a refreshing way to get a coffee hit. The only downside is it is not a sipping drink. You tend to reach the bottom of the glass in a hurry! Â Things are crazy at here with all the good weather. As long as it keeps up, I don’t know how much I’ll be able to add here in terms of recipes, etc., but the season is short, and we have to move the ice cream! I did sneak off for a couple of hours on my little boat, asÂ a neice and nephew who live in Germany were in town, and I took them plus my other nephew for a spin and swim. 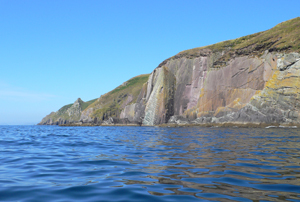 Anyone coming to Dingle should really try to get on a boat if at all possible as the coastline is so beautiful, and it’s so easy to get away from the crowds that pack into town this time of year. There are even completely empty beaches only accessible by water!